Herbal Spa Bath Salts Gift Set in a test tube with Muslin Bag*Set of Five*Free Shipping in the U.S. Through the stresses of life, magnesium is drained from the body. The average person is already deficient in magnesium, so this draining removes even the small amount a person has in store. Magnesium helps to produce the calming effect gotten from serotonin. The result of bathing in Epsom Salt and absorbing the magnesium are: improved sleep, concentration, and relaxed muscles. A wonderful recipe for peaceful sleep! Epsom Salt help boost the immune system. Bathing in Epsom Salt helps to stimulate the lymph system and circulate oxygen throughout the body. The salt bath helps keep toxins at bay in the body which can naturally drain the body and decrease immunity. No. 1 - Citrus Garden Blend: Sea & Dead Sea Salts, Epson Salt, Baking Soda, Kaolin Clay Powder, Dried Hops, Calendula, Rosemary, Comfrey, Chamomile, Yarrow, Echinacea, Plantain, Olive Oil, EO: Tangerine, Lemongrass, Grapefruit, Basil. No. 2 - Nourishing Blend - Sea & Dead Sea salts, Epson Salt, Baking Soda, Kaolin Clay Powder, Dried Calendula, Rosemary, Comfrey, Hops, Echinacea, Nettle, Passion flower, Pink Rose Petals, EO: Peppermint, Rosehip Seed Oil, Clary Sage, Lemon, Olive Oil. No. 3 - Cleansing Blend - Sea & Dead Sea Salts, Eps. Salt, Baking Soda, Kaolin Clay Powder, Dried Comfrey, Chamomile, Catnip, Mint, Red clover, Raspberry leaf, Thyme, Lemon Balm, EO: Spearmint, Pine Lemongrass, Eucalyptus. No. 4 - Relaxing Blend - Dead and Sea Salts, Eps. Salt, Baking Soda, Kaolin Clay Powder, Dried Calendula, Lavender blossoms, White Sage, EO: Lavender. No. 5 - Unscented - Dead and Sea Salts, Eps. Salt, Baking soda, Kaolin Clay Powder, Sweet Almond Oil. 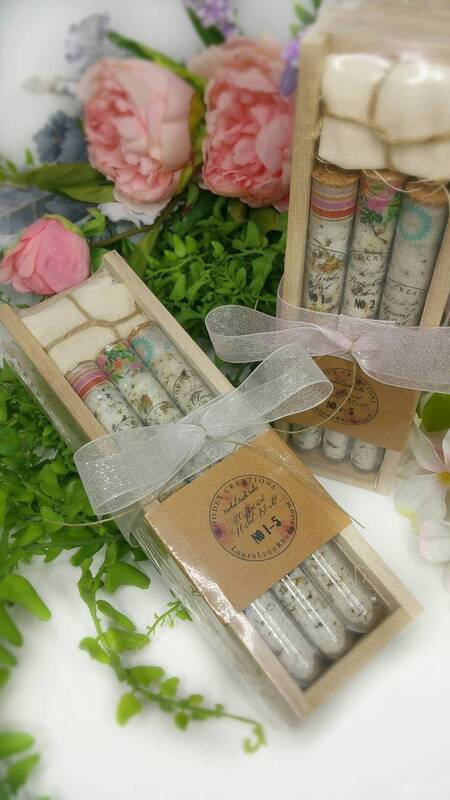 Dried herbs, blended to perfection, are packaged in acrylic test tube. Empty tube contents into muslin bag. Tie off bag and Toss into tub for a relaxing soak. These bath teas bring healthful benefits both through the skin and by breathing in the pure scents. No time for a bath? No tub? Bath Teas can all be used as foot baths or steams for positive effects. A basin of hot water and a towel are all you need! Relax & Enjoy! Store salts in a cool dark place away from heat and moisture. It is packaged in a wooden pencil box and wrapped with ribbon. It is shrink wrapped and ready for gift giving. **As with any item containing herbs/essential oils, please consult your physician before using if you are pregnant, nursing or on medications. Please note: This listing is for the box set, all other items are for display purposes only and not included. Herbal Bath Salts*Bath Tea in compost able tea bag*U-Pick Scent*2 oz * Single or Set of Three*Free Shipping in the U.S.
Herbal Facial Steam*Comfrey, Chamomile*Rose*Calendula*Mint*Sage*Lavender&Free Shipping!